Home » Lawn Care Questions Answered » Question: What is this lawn weed? I received this question from a reader just before Christmas in December 2018. With the warm winter weather we were having they were finding this weed growing on their front lawn. Please can you help with this weed in my lawn. The house is two years old as is the lawn was laid by the builders. The 1st year was okay but this winter weeds have appeared and are spreading. The ground is quite wet. Plus I also had fungi appear on the lawn during the summer. Can you help? That looks like common chickweed (stellaria media). Sorry, I’ve not created a detailed page on it yet. I will do soon. It is an annual lawn weed. It produces thousands of weeds when it flowers so can get out of control if left unchecked. These types of weeds only need one to flower and they can appear all over the lawn the following season. 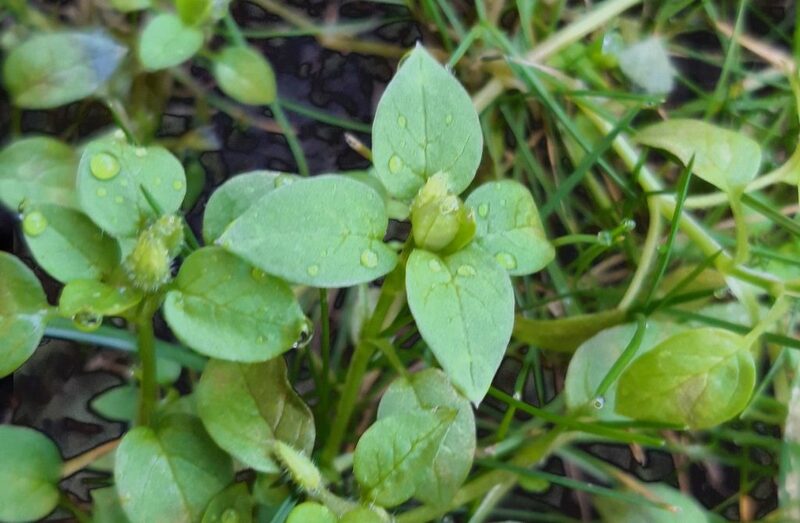 Chickweed seeds germinate late in the year, so it is not a surprise to see it doing so well in the winter. No weedkillers will be effective to control it in the middle of winter. I recommend trying to manually pick out as much as you can before it flowers. Then apply a pre-emergent weedkiller in the spring and which will help to keep any regrowth at bay. I would then keep an eye on it over the summer. Re-treat any new growth around May / June time and that should control it completely. Annuals are quite easy to keep in check. Stopping the flowering and seeding cycle will prevent new plants appearing quite soon. You also mention fungi, but I wouldn’t worry about that unless they hang around for a long time. Pick them or mow them in as they appear. Or let them fade naturally.